This week, Lawn Fawn is pairing up with May Arts for lots of fun! 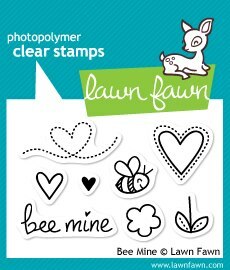 Lawn Fawn is known for its super cute stamps. And May Arts is synonymous with gorgeous ribbons. It's a good marriage! I created a Christmas card for this. I've been making different holiday cards for the past month or so, and this might be my favorite! 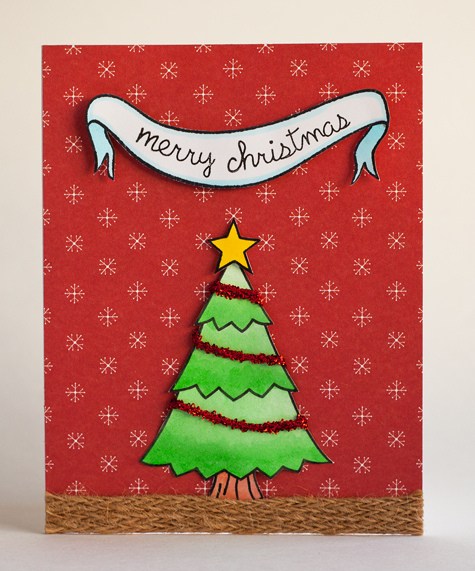 The patterned paper is from Lawn Fawn's 6"x6" Fa-La-La Petite Paper Pack. I stamped the tree onto white cardstock and used watercolor crayons to color them. 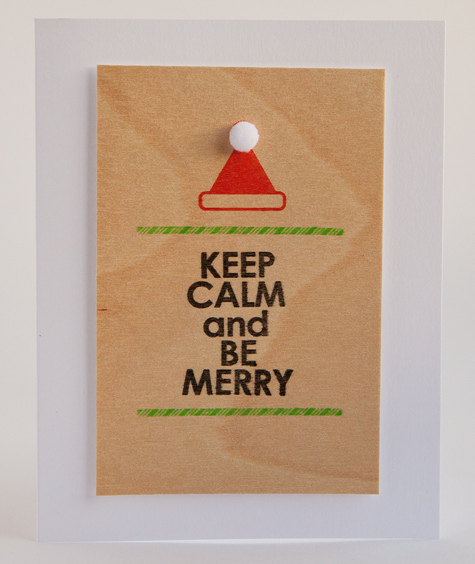 Then I stamped the star and the banner and the sentiment, and colored them in with markers. I fussy cut them out, and wrapped May Arts' sparkly string around the tree, using wet glue to stick it in place. The "soil" is May Arts' woven burlap ribbon. Don't forget to drop by Lawn Fawn and May Arts' blogs for lots of inspiration and prizes! Thanks for coming by today. I've had this piece of wood veneer from Creative Imaginations for a while, and I really wanted to see how it inks up. I'm totally in love. Wondering how many projects with wood veneer is too many. It cuts so easily too! I used two sets of stamps for this project. The sentiment and hat are from Teri Anderson's Twinkle On, and the ribbon is from Ali Edwards' Jingle All The Way. I used pigment ink because it's thicker, and less likely to "run" into the grooves. A little bit still spread out, but I still love this thing! Add a pompom, mount it on a white card base, and it's done. Drop by Technique Tuesday's blog for more projects! I'm off to Maui for the next 10 days. Don't hate me. I'll share some photos when I get home! Be good til then. Me again! With more Lawn Fawn cuteness. 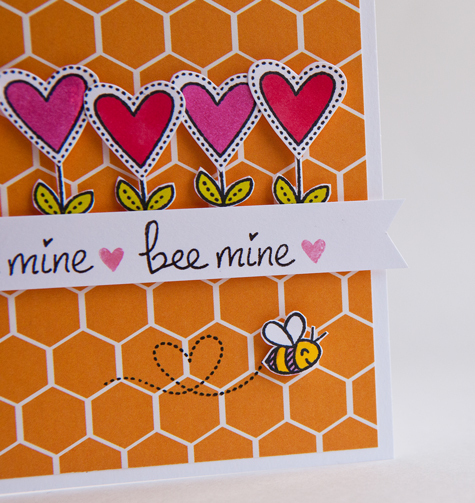 Today, Lawn Fawn is launching Bee Mine. It's a smaller set, but full of potential! Pretty simple card. 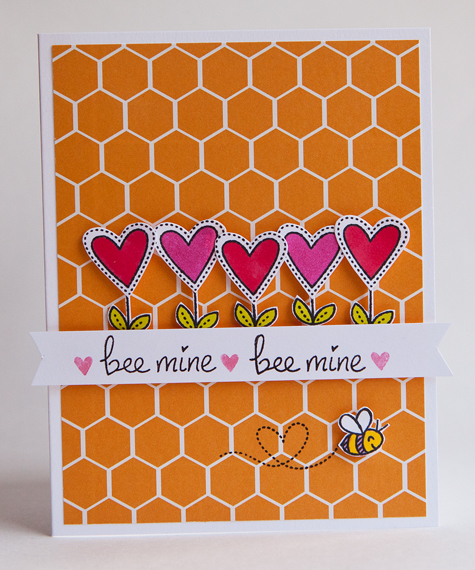 What took the most time was cutting around each heart, stems, and the bee. But once that was done, it was just 5 minutes to assemble the whole thing. The hexagon paper is from Lawn Fawn's Dewey Decimal 6"x6" paper pack. Drop by Lawn Fawn today for a chance to win some stamps! Thanks for stopping by. Happy Wednesday! Hey there again! Lawn Fawn is launching its newest release today: Here's The Scoop! Yes, we are talking Valentine's Day already. Although, really, these are perfect for everyday love notes. Ice cream story I must share. My father is a huge fan of ice cream. HUGE! When I was growing up, we lived in Rio de Janeiro, and my father tried out every single gelateria in town to find the best gelato shop. He asked them to make us custom gelato. As a matter of fact, my father would sometimes make his own base, haul it to the shop, and they would whip it into frozen perfection. That's dedication. He was making fig gelato before it was fashionable (and a few other awesome flavors). To keep our large inventory, we had a huge freezer just for it. We didn't have ice cream in the normal gallon size. Ours were those tubs you see in ice cream shops. Did I mention me and my siblings were really popular with kids our own age? Yeah. We were. Back to the stamps and my card! I used some Echo Park for the background paper. I topped the seam with Lawn Fawn's natural hemp cord. 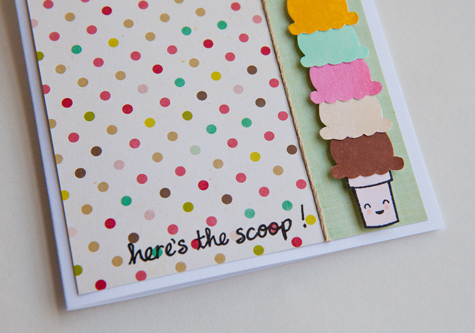 The ice cream cone was stamped and colored with alcohol markers, and trimmed out. Same with the heart. 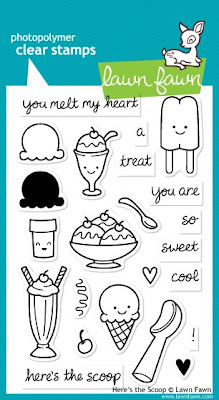 The ice cream scoops were stamped and cut out. Then it was simply stacking them and popping them up on the card. The sentiment is part of the set. 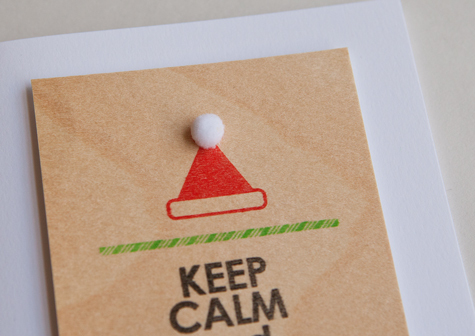 Don't forget to drop by the Lawn Fawn blog to see what the rest of the team created. And for a chance to win a lot of new goodies! Yikes! Another year going by. I read something the other day that is so true: "The days are long, but the years are short." It needs to be a poster, doesn't it? I've got a layout to share today. It's in Creating Keepsakes' latest special issue, Scrapbooking Babies and Toddlers. It's about The Nose! That would be my nose. Which is also my mom's nose, and grandmother's nose. It might have been her mom's nose too, but I never met my great-grandmother, so I cannot attest to that. When I was little, growing up in a sea of people with perky little ski slope noses, I really hated my nose. My mom sold me some story about our nose being lucky. But apparently she knew what she was talking about. I've been nothing but lucky! When my littlest was born, he had my nose, which seriously, is so much cuter on him. A most adorable button nose. Alas, the button nose is not too buttony anymore. It's definitely following in the direction of my husband's Northern/Eastern European ancestry. A more... uhm... prominent shape. Oh well. That would be little me in the circle. Yes, wearing three piggy tails. 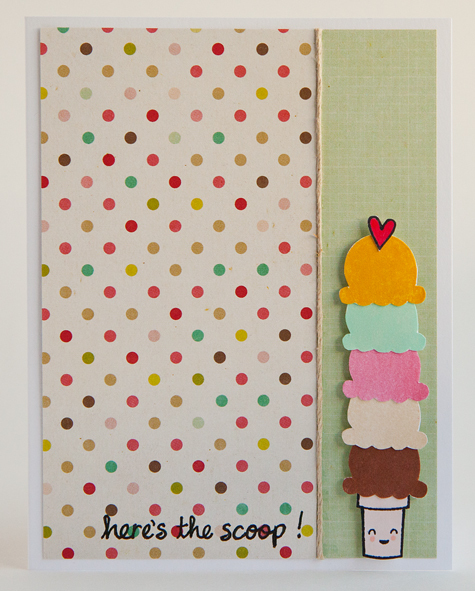 As seen in the Scrapbooking Babies and Toddlers special issue of Creating Keepsakes magazine. Copyright Creative Crafts Group. Posted with prior permission from the publisher. Thanks for dropping by! See you tomorrow, when I'll share Lawn Fawn's new release. We are talking Valentine's Day! Already! See? Time does fly.